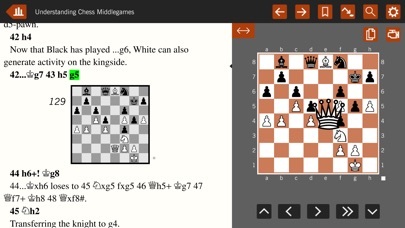 Ever wanted to read your favourite chess books and be able to instantly play over the moves on screen? 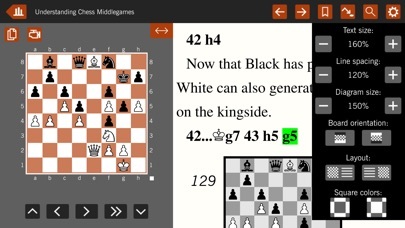 The revolutionary new Chess Studio, from renowned chess publishers Gambit, enables you to do that, and more. 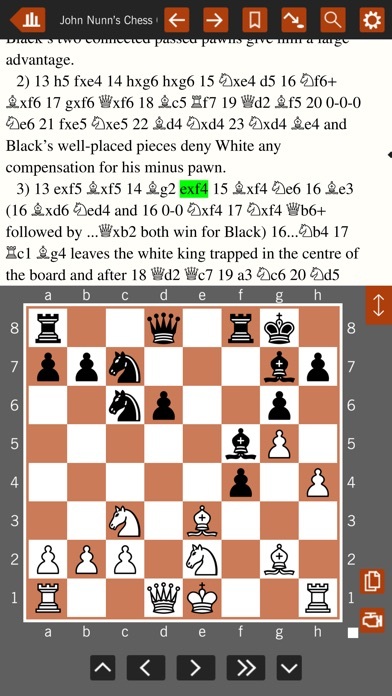 After downloading the free app, purchase your choice of classic chess e-books from the Gambit library and begin. 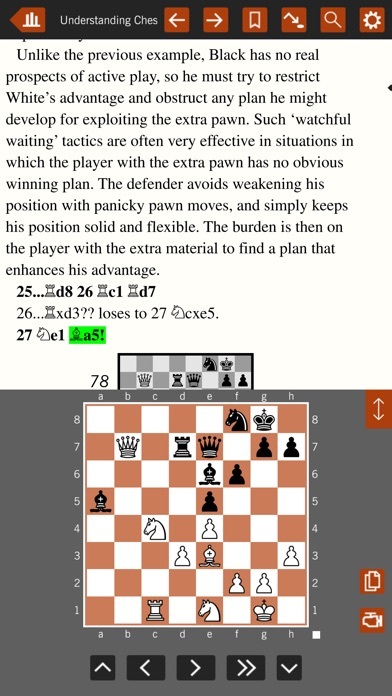 • text laid out in usual clear Gambit style • play over moves and variations on screen • accompanying text scrolls automatically • tap any chess move and the position appears on the board • easily navigate through complex variations • search function for words, phrases, player names • move swiftly between games and chapters • choice of layout options - including flip board • free sample text available to try out the app Chess Studio represents an enjoyable and portable new way of reading chess books, designed by chess players for chess players. Overseeing every aspect of the app design was Grandmaster John Nunn, one of the best-respected figures in the chess world and three-times World Chess Solving Champion. Great app with a good selection of books. Needs at least an analysis board so I can examine variations not covered in the text. Even the weakest engine would be nice too. 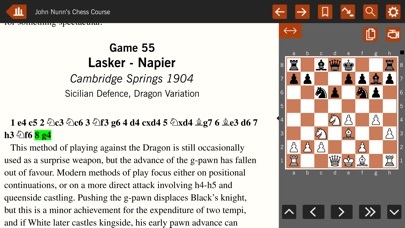 But still a nice app for reading on the plane or at lunch or anywhere you don't have access to a board. This is what a chess book should be...awesome!!! This is perfect when you cannot use a chess board to play over the position. Works perfectly for me while commuting on the train. Thank you Mr. Nunn! This is best by test. This app is amazing. It makes chess study more dynamic. I just got the book on Kasparov and going through one of his games took me half the time on this app. Moving back and forth between your book and the board takes more time than you may think. Also, with this app you can speed through an analysis and judge weather is worth spending time on it or if it's better to move on with the main text. 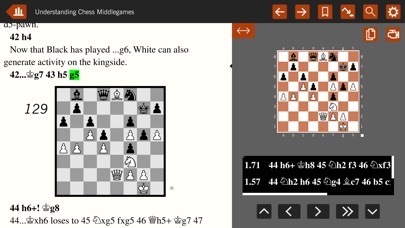 If you study chess and you are not an expert who can fly through chess books, this app will help you quite a bit. I cannot wait for Gambit to make more titles available (it would be amazing if they could include FCO as one of the titles for this app). There were retina graphics problems in version 1.0. I reported them to the publisher. And they were immediately fixed as a result. So the customer service seems to be excellent. The app now works very well. The control seems a little sluggish which is why I am only giving it 4 stars. The material however is excellent. 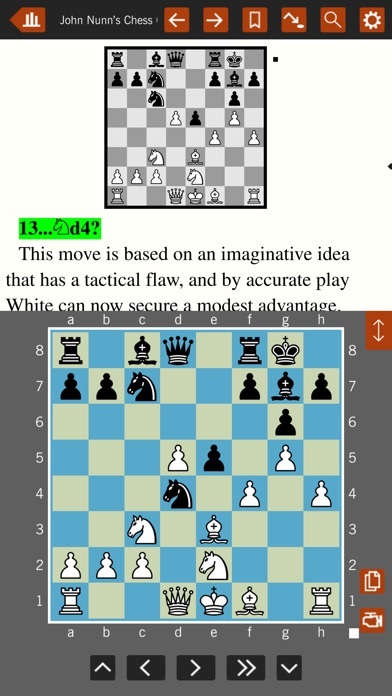 A classic app by Gambit and with the most recents John Nunn's books. I am loving it.